Meteo France relies largely on ski resorts for snow and avalanche information and so does not start a full service before the second week of December when resorts begin to open. The avalanche bulletin is only generally available in French and since last season has been distributed as an “image” rather than a text bulletin creating some accessibility issues on their website. In the majority of incidents the victims were not equipped with an avalanche transceiver or even Recco reflectors. Recco is now widely deployed amongst piste patrols and the rescue services and although not as effective as an avalanche transceiver has saved lives, particularly in off piste incidents. Lack of transceivers seems to be a particular problem this season amongst off piste victims. Snow shoers also feel unconcerned about avalanche risks. At least three of the victims could possibly have been saved if they had worn beacons and another victim would have stood a better change if he had not been alone. Over half the incidents reported to the ANENA so far this season involved multiple victims (although multiple burials only occured in a quarter of incidents) suggesting either a lack of appreciation of the risk on a given slope or problems with group spacing and organisation. The first fatality occured on the 5th December when a group of trainees with the UCPA triggered an avalanche on a closed run at Tignes. They were not wearing avalanche beacons. Three skiers were taken by the slide, two others managed to escape by grabbing hold of rocks. The first victim was found after a few minutes as their hand was sticking out of the snow. A probe line found a second victim alive after 20 minutes and a third victim was recovered dead after 45 minutes under the snow. 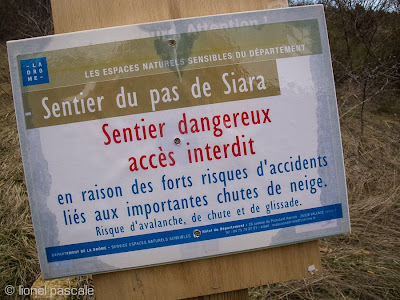 On the 6th a club group remotely triggered a slide on the Montagne de Sulens in the Haute Savoie, a route normally considred as “safe”. One victim was found thanks to a hand visible in the debris. A second victim without a transceiver was missing. Eye witnesses organised a desperate probe line, the PGHM arrived with a Recco, the avalanche dogs were on a pre-season training exercise, a second helicopter sent to fetch them.The probe line was on its third wave, over 30 minutes after the avalanche when they found the victim, a snowshoer in her 60s, lying calmly on her side just under the snow, she did not survive. According to an eye witness out of the 30 people on the scene only around half had probes/shovels and tranceivers. On the 9th there was a rare avalanche in the Drome when three friends climbed the Pas de Siara in the late afternoon. A cornice fall triggered a snowslab that took one of the group 100 meters. The rescue operation was complicated by the approach of night and the risk of a second cornice fall. The victim suffered severe leg injuries. On the 12th another serious incident in Tignes when off piste skiers in the Vallon de la Sache triggered a slide burying two. One was found by surface indications, the other spent 30 minutes in the snow and was in an extremely serious conditions. The risk was 4 and none of the group had transceivers. On the 13th a ski touring incident in the Chartreuse claimed one life when a large slab in the lee of a col buried two skiers. Eye witnesses helped with the rescue. On the 14th two cars were buried by a slide on the Col du Lauteret injuring two passengers. On the 16th a snowboarder was buried for 90 minutes in Risoul on the crêtes de Ravis off piste sector. He was buried under 250cm of snow and only found after 5 probe lines had covered the debris. On the 21st back to Val d’Isere when a guided group triggered a large slab in the Grands Vallons sector. A 71 year old skier was found dead by a piste patroller under a meter of snow. On the 23rd a piste basher was taken by a slide at les Arcs, the driver was airlifted to safety. 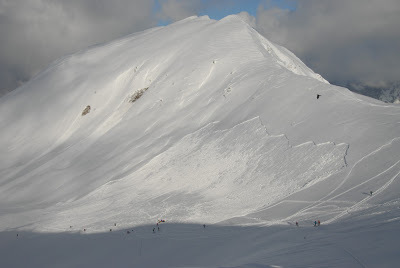 On the 26th a snowboarder was killed by an avalanche in St Véran alone and off piste. His body was discovered in the late evening by rescue workers. On the 28th another off piste skier was injured in Val Thorens on the popular Lac du Lou route, he was found by an avalanche dog and was not wearing a transceiver. 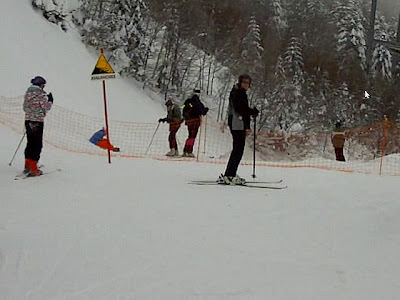 Following the New Year a teenager was killed skiing off piste with his dad at Gourette. The incident caused a polemic in the resort when it was discovered he had an expensive helmet camera but no avalanche beacon. Finally to end with some good news, a young ski tourer had a lucky escape when carried over cliffs on Pas de la Mine in the Taillefer massif. He escaped with minor injuries, thanks to a back protector and helmet but should he have been in this notorius pass which has been the scene of a number of incidents? This autumn saw colder, wetter conditions compared to 2011 with weather fronts in late October and late November bringing snow then a big fall in early December then a series of falls accompanied by wind with some high altitude rain and crusts in the snowpack and a yoyo in temperatures. It is the early thin snowpack and cold November followed by the varied conditions which seem to have created the instabilities, especially at altitude. Thanks to Richard who compiled the early season incidents. we should add the young British woman seriously injured in the Canadian’s couloir at la Plagne on the 10th to that list. Thanks again to everyone who has sent in or posted reports and additional information. Your piece, comments from seasonaire friends and a google search got me thinking… Here’s the best of the comments: “...yeah, I’m thinking of getting some safety gear. I’ll probably get a shovel first”. Reading his mind (snowboarder): won’t be wasted as I can build some kickers. Google search on “avalanche awareness courses”. Practically nothing. Can anyone tell me what happened to the English girl injured in the Canadian couloir on the la plagnes north face?